A flooded basement holds the potential to disrupt life, and the issue might involve anything from displacement and damage to annoyance and inconvenience. Nobody wants the problems a flooded basement brings, regardless of how much water enters and accumulates or whether it happens occasionally, frequently or never. Many property owners ask how to stop basement flooding, and it’s usually a multi-faceted answer, since everyone’s situation is a little bit different. Flood prevention calls for some learning, but can save countless dollars, big headaches and major inconveniences. Even what some might consider a “small” basement flood — like a non-catastrophic event — can incur thousands of dollars in costs for damage repair. One estimate puts the average amount homeowners pay after the basement has flooded at $1,038 to $3,067, with high marks closer to $6,000 and for the lucky, a low mark around $450. There are many variables at work with flooded basements, and the lengths to which homeowners should go to prevent flooding and protect the space depends on what’s down there and how high the water could rise. Some people may only have an old furnace and a few dusty boxes of garage-sale items, but for others it can be precious keepsakes, expensive electronics or antiques and irreplaceable collections. Everyone has seen either firsthand or in recorded images the awesome power water holds. Too much of it around a home from any source can cause movement and degradation of the foundation as well as flooding through cracks in walls or the floor. Ideally, a home needs solidly packed dirt all around its foundation to provide a good, level base. Water invades and creates pressure upon the structure. Water holds incredibly powerful hydraulic pressure, and it always finds a way through or around objects, following gravity and taking the path of least resistance. Basement flooding and its many causes hold the potential to cost money as well as threaten family safety and comfort with factors such as structural damage, mold and ruined possessions. Mr. Rooter of Greater Syracuse regularly shares information and services to help prevent many of the heartbreaking scenarios a flooded basement causes. As the possibilities reveal, water pressure of some kind causes most leaks and flooding. Sometimes the problem is obvious, and other times it will be hidden behind a wall or underground, but it’s essentially water under hydraulic pressure and it will definitely find a way to escape. 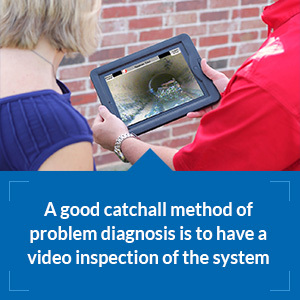 A good catchall method of problem diagnosis is to have a video inspection of the system, which can “see” inside the workings of the plumbing system. To unravel the mysteries of basement flooding is to understand the dynamic properties of water, an essential element. We cannot live without it, yet don’t want to live with it flooding our basements or other property. Water falls from the sky, runs from the mountaintops, travels underground in aquifers, flows in rivers and streams, sits in lakes and bubbles up from springs. Teams of scientists study weather patterns and hydrology, so if it seems like there’s a lot to understand when it comes to water and its management around the house, there is. Excessive watering of lawn or flowers can trickle to the foundation and basement. Consider watering less frequently. Ill-positioned sprinklers that spray the foundation can be repositioned so no water hits the house. When gutters are clogged or undersized, they should be installed at the right capacity and then maintained regularly. Install downspouts and check them seasonally to be sure they point away from the home. Mr. Rooter Plumbing draws from experience to talk about some of the common, but more complex, causes of basement flooding and suggested preventative measures to take against each one. We’re big advocates of seeking professional plumbing help, and people inevitably want to know what steps they can take in preventing basement flooding because of the expensive damage it can cause. Some places have a lot of groundwater, and it's common in those places to see sump pumps in homes — usually in the basement. The pumps work as much as is needed to move water away from your home. The reasons people need a sump pump vary, and might be because it's an area with heavy annual rainfall or a place where a house is situated in a way that gravity may need help to move water effectively. Install and situate the pump correctly, including the pit system. Have a secondary pump and backup power source. Clean filter/pump grates and maintain as needed. Replace pump before it fails at life end. To see if the sump pump just had a hiccup or has truly stopped working, unplug it from the electricity source, wait a few seconds and then plug it back in, when most pumps should automatically cycle. If it doesn’t, it may have died. A faulty sump pit: This is often the culprit in cases of flooded basements or crawl spaces. A sump pump usually drains water to some point below the home’s lowest grade — normally a sump pit — and then the sump pit drains into the yard or the local storm sewer. The sump pit itself is a strategically constructed hole usually lined with gravel, drainage tiles or both. Essential to the sump pump’s function is the pit size, slope, depth and material construction, all of which affect the overall performance of the system. If a pit is undersized and fills too fast or too often, it may cause the pump to run continuously and fail well before its expected life span. If the pit or the pump malfunctions, water will rise into the basement, with the questions of how fast and how much answered by individual ground water and other conditions. Lack of a sump pump or an aging pump: This can be a problem in any existing home, particularly older ones. New homes are required to have a sump pump if conditions call for it, but some older homes may need one and not have it. 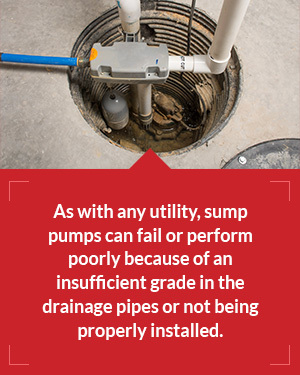 As with any utility, sump pumps can fail or perform poorly because of an insufficient grade in the drainage pipes or not being properly installed. Plumbers have also been called for a failed sump pump only to discover that it needed to be plugged in, was connected to a bad outlet or an area of the home blew a fuse or breaker. Overheating: Excess heat kills many a sump pump and often results from inadequate ventilation of the pump and from clogs that don't allow water to reach the pump. Some sump pumps sit in an open hole designed to catch water from the walls and floor cracks, and they usually have some kind of filter or screen to keep debris out of the water and pump. Once the filter or screen is in place, it also needs to be cleaned occasionally, or gunk accumulates and impedes water flow. One solution to a pump that overheats in a tight space is to replace it with a cast-iron or other kind of submersible pump, which the water cools continuously. Undersized pumps: Pumps of inadequate size tend to burn out quickly and fail. It can be frustrating when the pump seems just fine for normal conditions but doesn't keep up during heavy rainfall or spring snow melt. Weather patterns vary, and there's logic in investing in a pump to handle the heaviest or even beyond the heaviest expected load for the region. An undersized pump is much more susceptible to burn-out failure than one appropriately sized for its load. A stuck inner float: This malfunction typically occurs because dirt or debris has become lodged in the float. Keeping the pump filter and its grates or general exterior clean and brushed off keeps gunk out of the pump and helps it function more effectively. A stuck float may also cause the pump to run continuously and eventually burn out. Three main ways people keep the sump pump more-or-less clean are to lift it out and brush the exterior with a small, soft-bristled brush or broom. Some will take the pump to clean running water or bring clean running water to it to rinse it well. Another measure to prevent sump pump failure is to place it in a mounted, protective bracket so that it doesn't sink into dirt or move around much. Frozen pumps: This is not uncommon, and sometimes simply thawing them does not restore proper functionality, because the other fluids, apart from water in the pump, could have frozen as well. Once suspected freezing has taken place, it’s beneficial to replace fluids in the pump or replace the whole thing. Check valves: This is a part you’d normally expect to see on a sump pump, but it can affect the pump’s efficiency if it either does not have a check or its check valve is broken. Water-powered sump pumps: These are a popular choice for a backup or secondary sump pump. Household water pressure powers the pump without any battery or electricity when the primary pump or its electricity fails. The cost to install them is comparable to electric- or battery-powered, but the long-term maintenance cost is much less. Sump pumps have evolved over time to meet higher demands. At first, they were meant only to keep water away from the foundation of the house. As sump pumps came on the scene, people were able to expel standing water and use the basements for dry storage. Over time, sump pumps became the way to not only keep the basement free of water, but also enable people to finish the basement for additional living space. The more money a family has invested into the basement amenities, the more sense it makes to have a quality sump pump that will protect the space from floods. 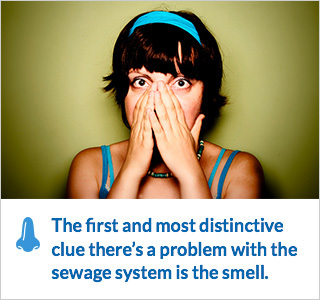 The first and most distinctive clue there’s a problem with the sewage system is the smell. Raw sewage is the worst, but just the gasses that result from a malfunctioning line or other troubled component create a foul odor. While water or sewage can cause an awful mess, the septic or sewage definitely adds a gross dimension nobody wants, and it lends an air of urgency to preventing sewer backup. These items can form clogs in the lateral sewer line, which is the piece that runs between a home and the public system. The same principle applies to septic systems. To safeguard what goes into the throne is to safeguard the private and public plumbing serving the home. For example, most of the supposedly biodegradable wipes on the market are actually not. They cause clogs and have prompted many cities, counties and other water providers to launch vigorous educational campaigns — or in some cases new legislation — against the use of the wipes. Along the same lines, it’s easy to find information in New York and other states about the dangers fat, oil and grease (FOGs) pose to public and private water and wastewater conveyance systems. Just like our human systems, fats, oils and grease stick to the insides of pipes and then repeatedly harden and accumulate more. These growths inside of plumbing pipes can look downright weird, but worse are the backups and slow drainage they can cause. While most people might not pour a pan of bacon grease down the drain, other sources of fat can be less obvious, such as meat scraps, vegetable oil from frying, heavy creams and rich sauces, butter and other fatty foods. 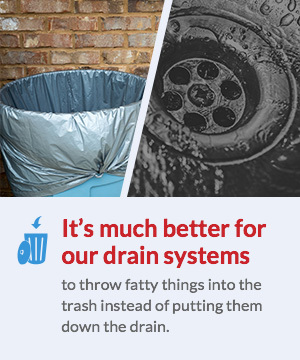 It’s much better for our drain systems to throw fatty things into the trash instead of putting them down the drain. You can always have the drain pipes professionally cleaned, but there are many home remedies you can try, such as filling the sink weekly and then letting the pressure of it draining clear the pipes. Some will say to flush the drain with boiling water to melt off oily substances or to mix up combinations of baking soda, lemon juice and vinegar for natural drain cleaners. Do this in the basement as another layer of protection and sewer backup prevention. For example, a future bathroom space with the rough plumbing connections installed needs a tightly-fitted, screw-on cap. Imagine the sewer line blocks and backs up or the septic tank gets full or its pump quits. The potential exists for sewage to come up through any such openings. Blockages and clogs can develop anywhere along a sewer, septic, water-supply or storm-sewer system. The tricky part with unseen blockage is finding where it is. Normally, if it’s dysfunctional within or underneath the house or on private property, it’s a homeowner’s responsibility to find and fix it. The problem can exist beyond a person’s property in the public sewer main or wastewater system, but the public entities usually clean and check them regularly or would notify neighborhoods of any known problems. Tree debris, leaves and foreign materials are notorious for blocking and clogging systems to the point where they either don't work at all or don't work well. You can examine your property and keep it clear of those things so they don't block your part of the public system. Average citizens can also contribute efforts by removing any obvious debris from the street levels of public systems, like branches or trash on the grates or any drains that flow to the common system. It’s also worth spreading the word that grass clippings and other lawn waste should not be allowed to wash down the storm drains. The best protection from foul basement flooding is probably the costliest option, too. It's a below-grade sump pit and pump with plumbing that routes the overflow into the main system in the event of a flood. Another commonly used basement-flooding prevention method is a backflow-prevention valve or backwater valve. They're installed at the base of a building and then connect to the main sewer. A home’s water heater supplies a crucial utility, but it needs maintenance and monitoring to provide uninterrupted service. It supplies our hot showers and helps us keep things clean, so a sudden lack of it tends to put a crimp in household operations. According to the Insurance Institute for Business and Home Safety, a failed water heater is a top-five reason why homes sustain water damage, with an average post-deductible cost of about $4,444 in damages per incident. Prepare for replacement a few years before average lifespan ends. Make a schedule for flushing out damaging sediment and rust. Inspect all parts, especially connections, with a bright flashlight regularly. Place a dehumidifier in the utility room to stave off moisture, which causes rust. Wrap the water heater with an insulating cover to prevent condensation from forming on the tank. This also saves energy by helping hold in heat. A water heater leak is bad, but a water heater burst is the worst. Minerals and dirt commonly accumulate in water heaters and their parts to the point of a clog — then, that clog causes a leak and sometimes a burst that immediately floods the basement or other space with gallons and gallons of water. Most water heaters hold 40 to 50 gallons, plus an incident could leave the supply line open and pouring, too. Parts of any water heater can wear, loosen and rust or otherwise degrade over time. While some have better or worse longevity, the average life of a water heater is about 10 years. The most common place water heaters begin leaking is where they connect to the water supply and any other joints, seams, valves or attachments. Everything expands and contracts repeatedly over time, and that movement inevitably causes shifting and degradation. Depending on where the water heater is located in the house, a slow leak may also permeate drywall and other materials in the area, which creates mold. Crisis-avoidance experts say to have the water heater inspected at least at least annually if it’s no longer warrantied, and if it’s under warranty, once every two years. While perfectly good water heaters have been known to burst for various odd reasons, most of them don't go without at least a little warning. Most problems begin as a dripping leak or a bit of corrosion that grows. 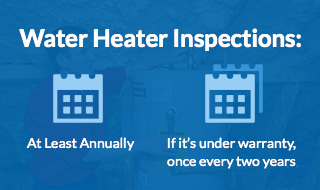 Prevention of problems can be as simple as to keep a regular eye on the hot water heater and basically inspect every inch of it to be sure no problems have started. Create clear access to the water heater. For some, finding and uncovering the water heater is the first step toward proper maintenance, because it sometimes gets buried or covered under the stuff that inevitably lands in basements, garages and utility closets. Cut electricity and water supply to the water heater. Drain water from the tank using a hose and pump. Inspect the water coming out for sediment. Turn water on to refill water heater and drain again. Repeat step four until the water runs clear, with no sediment in it. An anode rod is a part of the water heater that's designed to prevent corrosion. Depending on the mineral content in the water supply and how frequently the water heater works, the anode rod itself may corrode and need replacement a few times over the water heater's lifespan. While the fact that it corrodes means the anode rod has done its job, it also means it has become ineffective and must be replaced so the tank and other parts don’t corrode. Preventing a burst water heater requires that you keep a close eye on the utility, its parts and its function, as well as do regular inspections and maintenance. It sounds like a lot to do, but once you get used to the routine it isn’t too bad, and even one water heater flood convinces skeptics the effort is worth it. Preventing flooding in the basement could also save other utilities like water softeners and furnaces. Flood waters can short out electrical components of an electric water heater and clog the lines of a gas water heater, as well as ruin the insulation inside the tank of either type. Once it has been substantially soaked, an electric water heater probably won’t work. Water runs in a few places we can see it and many others we cannot, such as underground aquifers and springs. Every babbling brook, flowing river, running stream and standing lake contributes to the overall watershed and its characteristics. Individual homestead traits can vary from neighbor to neighbor, with one getting water up through the floor drain regularly and another never seeing any water in the basement. It’s important to be aware of the geographic areas where the water table runs or rises high, because that water can put damaging pressure on the home’s foundation and walls. There are a few ways to protect the basement in places with a high water table. Install, replace or upgrade sump pump and corresponding pit. Drain floor separately from overall home system with a reroute, a bypass or an overhead system. Put in and use a foundation drainage system. Implement a drain plug in floor drains. Given the unpredictable and dynamic nature of water, it’s tough to talk in absolutes about what will prevent basement flooding resulting from a high water table. A sump pump is a common solution, since its expense is fairly reasonable and it’s needed to evacuate water away from the foundation anyway. A backup sump pump with an alternative energy source, such as a battery, or a water-powered backup pump adds more layers of protection. People commonly use a sump pump to evacuate any excess water away from the home, but if the sump pump performs below expectations, many people upgrade it to a higher capacity. Some challenging situations may remain unresolved even by sump pump and pit improvements, so people will install a secondary drainage structure on the exterior of the home. Gutters: These do a lot to prevent basement flooding in any location, but especially in those with a high water table, where it usually rains a lot. Basement and crawl spaces will flood if a home doesn’t have sufficient gutters, downspouts and roof drainage. A typical 2,000-square-foot home would produce about 1,250 gallons of water from a one-inch rainfall event. The runoff volumes must be managed or they go straight to the foundation and make trouble. It's essential to not only have the gutters but also keep them clear of clogs such as leaves and debris since big wads of gunk render the gutter systems ineffective. The same can be true about downspouts when they are clogged or not turned away from your home. A standpipe: Standpipes are cheap and common ways to prevent basement flooding, but it provides only so much protection. They’re typically about three feet tall and give the backed-up water somewhere to go besides all over the basement. The standpipe normally consists of a piece of pipe fitted to the exact size of the drain with a sealed, watertight connection. Waterproofing or weatherproofing the foundation: This is usually considered a costly measure and still requires that water-evacuation tools be in place, but the various sealants and wraps can provide a layer of protection against the moisture. Especially when an existing problem might involve an underground drainage structure and digging or trenching is already required, it’s worth considering a weatherproof or waterproof project. There are some techniques such as sealant finishes that can be applied to the foundation concrete or stone. Synthetic wraps can also go around the foundation, much like the other parts that are wrapped in a weatherproof material. These solutions, of course, require access to the foundation of the home, but they can be effective blocks against the flow or flood from a high water table. 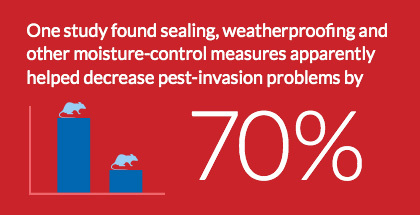 As an added plus, weatherproofing helps protect the home from insect and rodent invasion. One study found sealing, weatherproofing and other moisture-control measures apparently helped decrease pest-invasion problems by 70 percent. It’s not advisable to simply wrap the foundation or basement walls and let the water flow past, but to implement management techniques along with it such as a sump pump and pit and improved drainage away from the foundation. Slope affects everything: A lot of groundwater and a high water table makes it especially important to make sure the slope surrounding a home is correct. Another crucial aspect of foundation drains is to make sure they're pitch perfect. The slope of the drainage utility, whatever its construction, must be at the correct descending degrees and angles, or the water may not flow correctly or at all. While some plumbing codes vary from area to area, generally speaking a typical four-inch diameter foundation drain should pitch at least four inches for every hundred feet of length. Additionally, the International Residential Code calls for at least six inches of fall in the first 10 feet of slope away from a house. The plumbing codes of each state, and even each city, carry with them general requirements for the slope of all plumbing elements that carry water. The pitch and slope requirements result from all those scientists studying the dynamics of water and gravity to come up with design standards meant to help everyone build more safely and effectively. A subsurface drain: These drains route water away and might be made of perforated plastic, metal or concrete. They’re usually about four inches in diameter and wrapped in washed gravel, sand or a mixture of both materials. Sometimes the materials surrounding the drain pipe are encased in a mesh or wrap to prevent the sand and gravel from washing away. Most people realize that water is an unpredictable element of nature. Professional and proactive measures benefit the plumbing, but it would be incorrect to speak of a dry basement in absolute terms. The most successful prevention strategies involve regular maintenance of the plumbing system, including all the pipes and working parts, at least annually if not seasonally. Home and building owners can schedule regular checks so it’s off their mind and vital components like water and sewage are managed properly and more-or-less automatically. Part of a good protection strategy against basement flooding should be inquiries into insurance, since most homeowners’ and renters’ policies don’t cover any kind of flooding. It’s not uncommon for people to discover this after water damage and then be stuck with replacement costs. Some policies cover structural damage to the basement but not any contents ruined by water, which requires additional coverage. It helps to have an insurance agent explain the existing conditions and possible options so you can add coverage if needed. 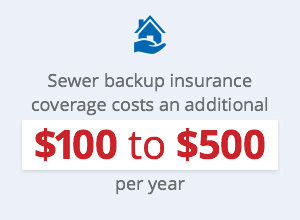 In fact, a trend seen in insurance is that most homeowners’ policies used to include incidents of sewer backup but now do not, those policies cost an additional $100 to $500 per year. The National Flood Insurance Program offers basic basement coverage, and it covers "structural elements, essential equipment and other basic items normally located in a basement, as well as cleanup costs.” It would not cover stored or finished contents of the basement, such as drywall and furniture. Most people know the characteristics of their basement after a few years and some of the weather patterns of the region, but if not, it’s data worth researching. For example, does the home you seek to buy sit in a floodplain? How old is the home, and has it flooded before? If so, how much and how often? Most cities and counties have floodplain maps, as well as insurance companies, banks or title agencies and the Federal Emergency Management Agency (FEMA). Do not enter the basement or any building with electricity if there are more than two inches of standing water or if the water has reached any electrical component. Cut power, gas and water at mains before entering. Evacuate water as soon as possible. Wear rubber gloves, boots and eye protection during water removal and disinfection. Dry the basement completely with pumps, dehumidifiers, box fans and open windows and doors, as soon as possible. Throw away any items contaminated with flood water, especially if it was sewage or could have contained it. Disinfect the entire area with a solution of chlorine bleach: One gallon of hot water with four-to-eight teaspoons of bleach. Allow the basement and everything in it to dry completely. Mr. Rooter of Greater Syracuse offers a full-service partnership for all of your basement flooding and other plumbing needs. Our licensed professionals know the regional water characteristics and have the complete technical knowledge to resolve even the toughest basement flooding problems and to implement preventative and protective measures of all types and levels. 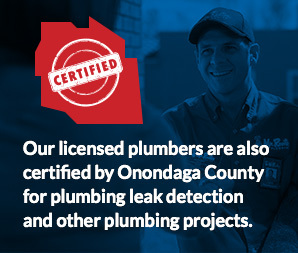 Our licensed plumbers are also certified by Onondaga County for plumbing leak detection and other plumbing projects. We offer the no-charge plumbing checkup, which provides peace-of-mind when everything is okay, but helps find any risks before they become expensive problems. Anyone who has a problem can, of course, reach us anytime for responsive, ‘round-the-clock service for basement flooding, backup emergencies, burst pipes and other critical situations. Mr. Rooter Plumbing can help with everything from crises to prevention, including repairs, improvements, system setup, inspection and maintenance. We would be glad to help resolve your basement or crawl space flooding problems, so don’t hesitate to connect with us and see what solutions might fit your needs.